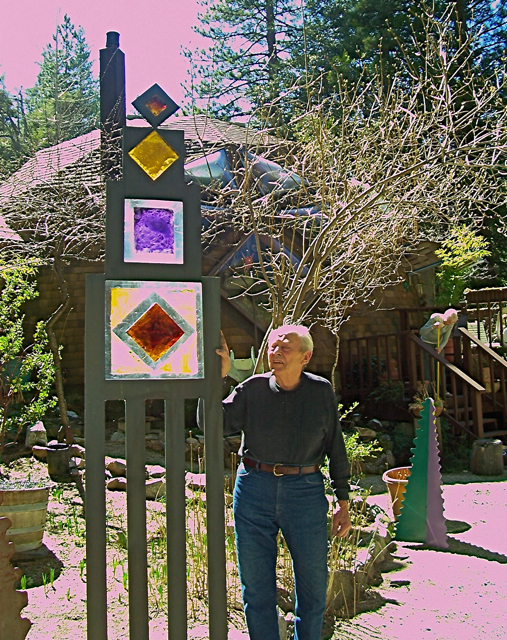 Darwin, an Idyllwild sculptor, is not one to shy away from large art projects. His giant cowboy hat, which sets on top of Wooley’s, is testament to that. “C’mon, you’ve got to see my tree,” said Darwin to friends standing outside Higher Grounds. Inside, Darwin had created a life-sized tree with a large trunk and several limbs that stretched across the high ceiling. 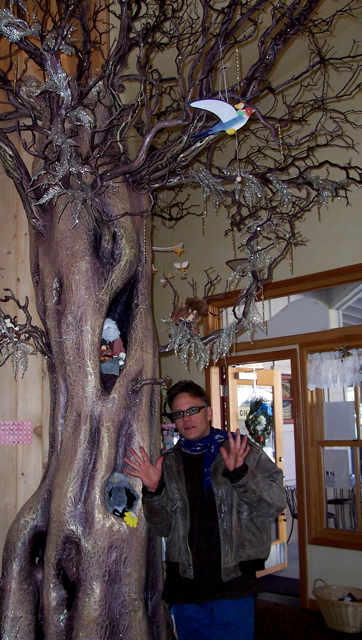 “My kids call it, ‘The Magic Tree,'” said Julie Fourroux, one of the owners. The idea of having an interior tree sprung from a need to do something with an odd corner, Julie said. 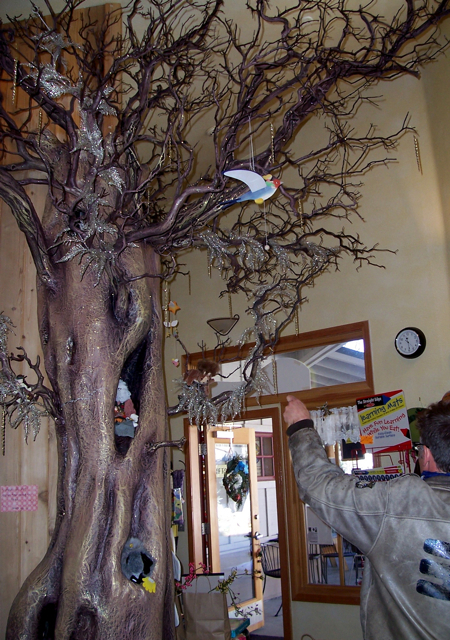 The toy shop stands in the former location of the Idyllwild Chamber of Commerce and the Idyllwild Realty office. Her husband Chris suggested that they put in a natural tree trunk called a “wrap,” similar to the posts holding up the porch outside. Then Julie suggested an entire tree, and Darwin, who had been standing there, said that he’d like to build them one. For nearly a month, Darwin set up his workshop inside the toy store. 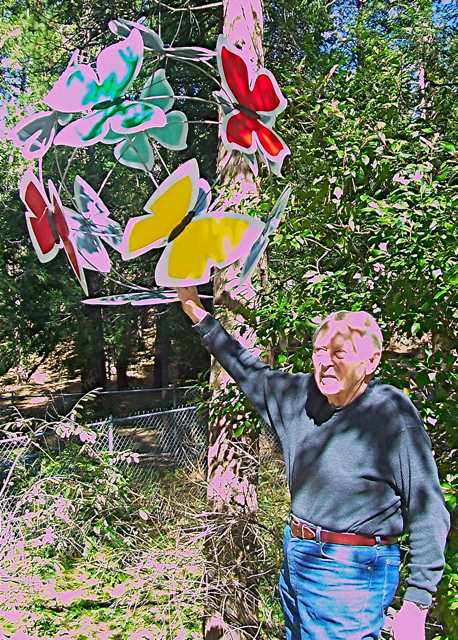 He worked half days from a large table, while his manzanita branch collection stayed outside. 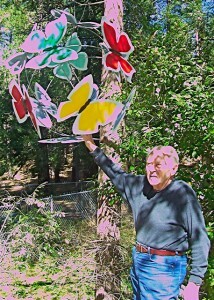 “I found the manzanita limbs up in the high country,” Darwin said. He sanded them down and added clear varnish, showing their natural dark red color. 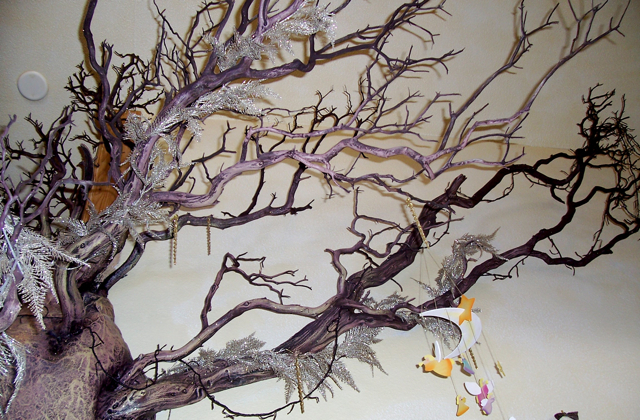 The rest of the tree was constructed from everyday materials, including chicken wire, paper mache, large carpet tubes, paint, and varnish. Darwin knew, after creating a giant hat for Wooley’s, that sound construction was key. 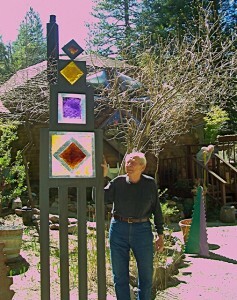 (See ‘Hats Off to an Idyllwild Artist,” an Idyllwild Me blog post dated March 2, 2010) Because large sculptures like these are only as good as they can last. Darwin’s Wooley’s hat had to withstand Idyllwild’s extreme weather conditions, such as snow, rain and wind. 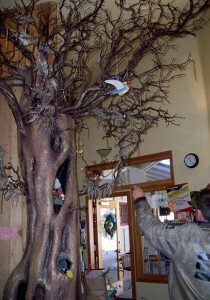 At least, The Magic Tree was inside the toy shop, and only needed to be securely mounted. 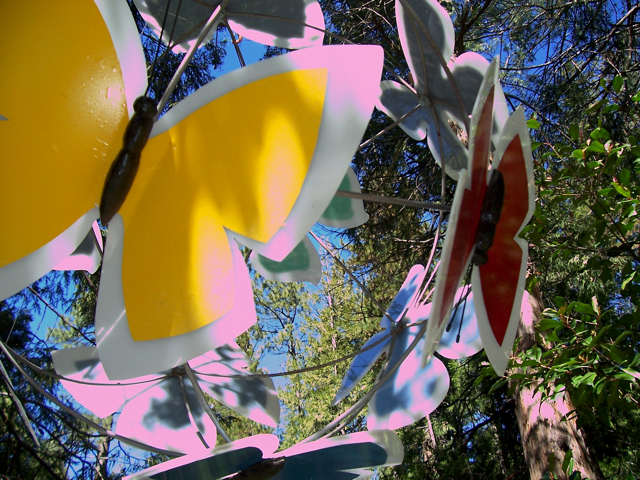 However, it stood over 15 feet tall and weighs about 300 pounds. When Darwin was forming the chicken wire, and before adding the paper mache, Chris mounted some electrical equipment inside. The equipment would be the energy source for the twinkling lights on the branches above. However, to deter teens and children from trying to climb it, they put up a sign. “So far, everyone’s been respectful,” Julie said. Teens like it best, Chris added. “They stop at the door, look up and don’t go any further. However, the younger ones, look at it briefly and run to the toys, added RJ, the toy store clerk. 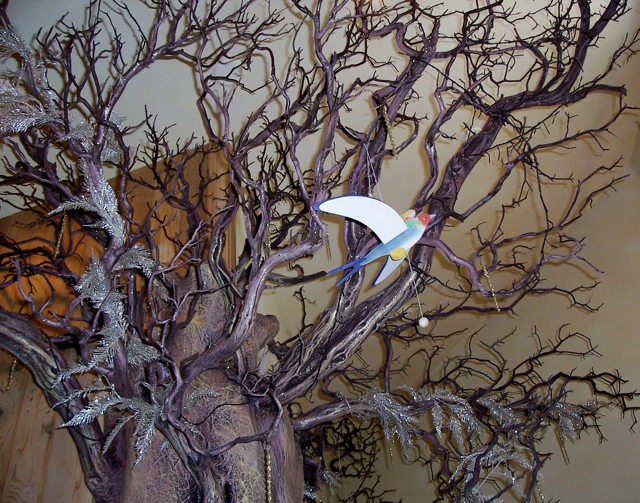 To get the texture of the bark on The Magic Tree, Darwin used crumbled up newspaper. Then he added many layers of brown acrylic paint. So he toned down the color to a lighter brown, and added lots of glitter, adding to the “magical” feel. 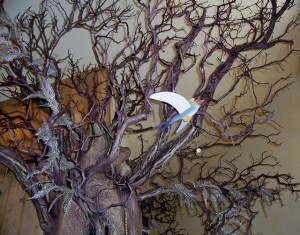 In addition to the twinkling white lights, there are some ornaments, such as birds, hanging from the branches, and little stuffed animals inside the knotholes. “The plan is to add some paper snowflakes, and make it seasonal,” Julie said. Her mother gave her the idea. She has an inside tree in her home that she decorates with ornaments according to every season, such as Christmas, Easter, Valentine’s Day and St. Patrick’s Day. “We plan to add decorations to the tree, and when there’s no holiday, we’ll just add leaves,” Julie said. Chris said that they’re pleased with the results and Darwin’s professionalism.